1) A signal is a mechanical or electrical device erected beside a railway line to pass information relating to the state of the line ahead to train/engine drivers . 2)The driver interprets the signal's indication and acts accordingly. 3)Typically, a signal might inform the driver of the speed at which the train may safely proceed or it may instruct the driver to stop. 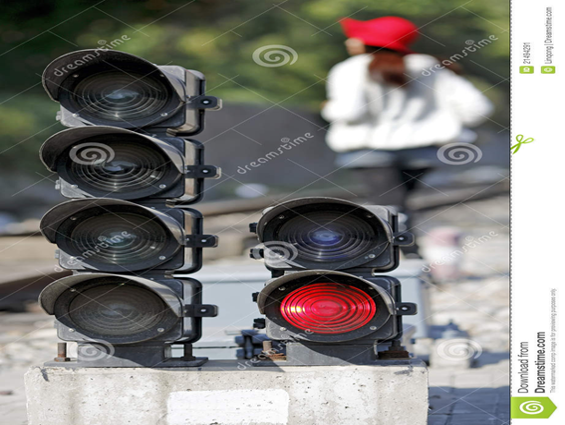 Originally, signals displayed simple stop/proceed indications. As traffic density increased, this proved to be too limiting and refinements were added. One such refinement was the addition of distant signals on the approach to stop signals. The distant signal gave the driver warning that he was approaching a signal which might require a stop. 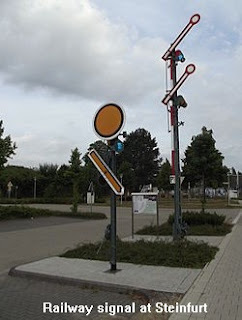 This allowed for an overall increase in speed, since trains no longer had to stop on sudden warning. 2)that the driver has permission to proceed. 3)the points (also called switch or turnout in the US) are set correctly. 4)the state of the next signal. 6)Signals have aspects and indications. DARLINGTON TO STOCKTON (U.K.) UNIFORMED MEN ON HORSES GUIDED THE TRAIN . 1830 : FIRST PASSENGER TRAIN BETWEEN LIVERPOOL AND MANCHESTER POLICEMAN WERE POSTED AT FIXED INTERVALS. 1853 : FIRST TRAIN SERVICE INTRODUCED ON INDIAN RAILWAYS, SEMAPHORE SIGNALS WERE USED . 1)Older forms of signal displayed their different aspects by their physical position. 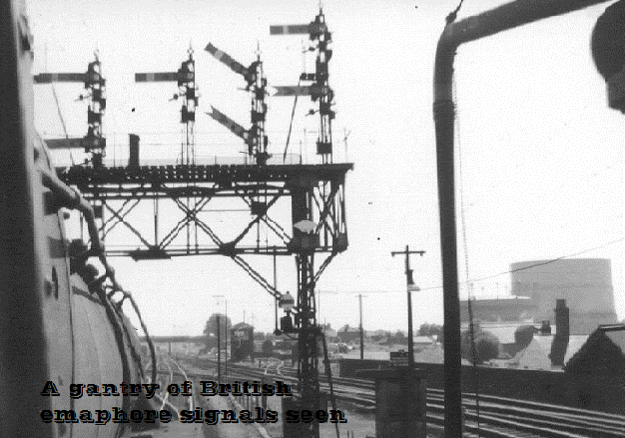 2)The most common form of mechanical signal worldwide is the semaphore signal. 3)This comprises a pivoted arm or blade that can be inclined at different angles. 4) A horizontal arm is the most restrictive indication (for 'danger', 'caution', 'stop and proceed' or 'stop and stay' depending on the type of signal). (Available on WR (1987) & CR Suburban Sections on Mumbai). 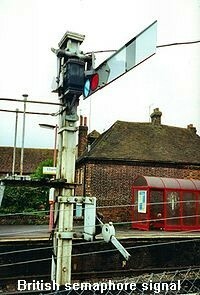 When a single track is involved, the signal is normally mounted on a post which displays the arm or signal head at some height above the track, in order to allow it to be seen at a distance. The signal is normally put on the engine driver's side of the track. 1)Such signals may be physically smaller (termed dwarf signals). Rapid transit systems commonly use nothing but dwarf signals due to the restricted space. 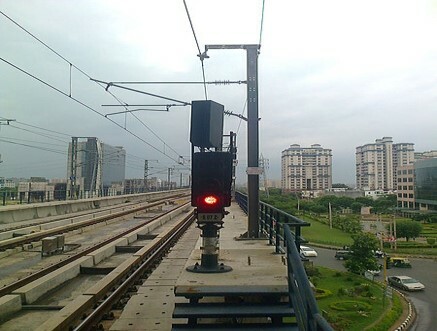 2)In some situations where there is insufficient room for a post or gantry, signals may be mounted at ground level. * Trains are Spaced Over an length of a track in such a way that , if the first train stops, the following train driver should be able to stop the train in sufficient distance without colliding with the first one. *This type is used where traffic is less and weight of the trains are less. In this method of “Control Over Movement”, the length of the track is divided in to sections called Blocks. The Entry of a train in to the ‘Block’ is controlled in such a way that only when it is free, a train can be allowed to enter it. This means that between two consecutive trains , there is definite space interval. Temporary signals are located as When train is required to stop and the restriction on track is to be kept for more than a day. When train is not required to stop and restriction on track is to be kept for more than a day.